There are a lot of ways to carry your baby, but using the best baby ring slings is one of the best. They’re easy to use and they keep your baby close to you at all times. If you’re not sure what to look for in a sling, that’s okay! We did a lot of research and found some of the best products out there. Before we get to it, let’s take a quick look at some of the features you should know. Sizes: All but one of our top picks are one-size-fits-all. These baby holders are designed to be easy and adjustable. You shouldn’t have a problem getting a good fit that keeps you and your baby nice and comfortable. Weight Limit: If you’re planning to use your baby carrier through toddlerhood, make sure you get one with a high weight limit. Of course, there are several available that are specifically made for babies and infants, too. Material: With a few exceptions, the products we chose are mostly made of cotton with a little Spandex thrown in. The Spandex gives the cotton just the right amount of stretch so you’ll be able to make easy adjustments. Head Support: Technically, these slings don’t have any built in head support. That’s up to you and how you wrap your little one. Head support is important for newborns so check the manufacturer’s instructions for how to position the sling. Carrying Bag: A carrying bag is a great way to travel with your sling. Whether or not a carrier has a bag included doesn’t really change how much you or your baby will like using it. It’s a nice added bonus. Machine Washable: Believe it or not, this is one of the most important features. Babies and toddlers can be very messy. It’s essential that you be able to just toss this thing in the wash when you need to. Now that you have a better idea of what to look for in a ring sling, let’s take a look at our baby sling reviews. If you’re short on time, don’t worry. We put our top and budget picks right at the top of our list so they’re easy to find. This is a great place to start but stick around if you can! The 8 other products we found are excellent, too. Alright, let’s get carried away in our reviews! 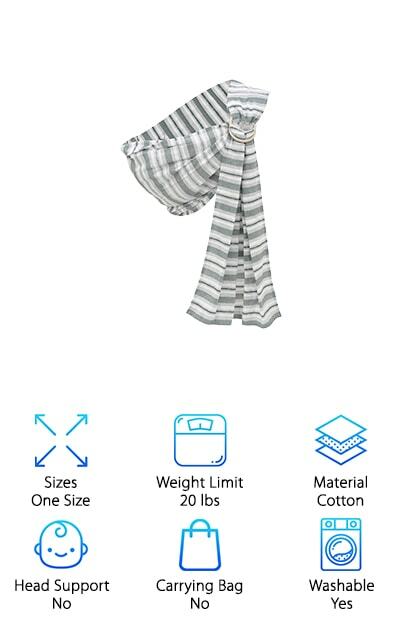 Our top pick for baby ring sling comes from Mamaway. The patented pocket design is one size fits all and easy to adjust to different body shapes and sized. At 32.5 x 85 inches, it’s wider than most comparable products. It holds up to 50 pounds which makes it great for toddlers up to age 3, too. 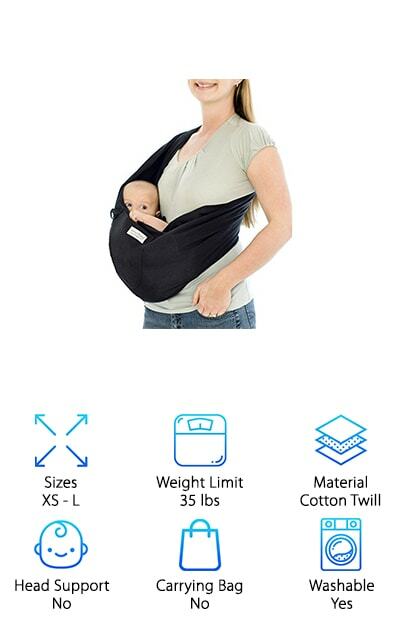 Because this carrier spreads your baby’s weight evenly over your shoulders and back, you’ll be able to carry your baby for longer periods of time without any discomfort. 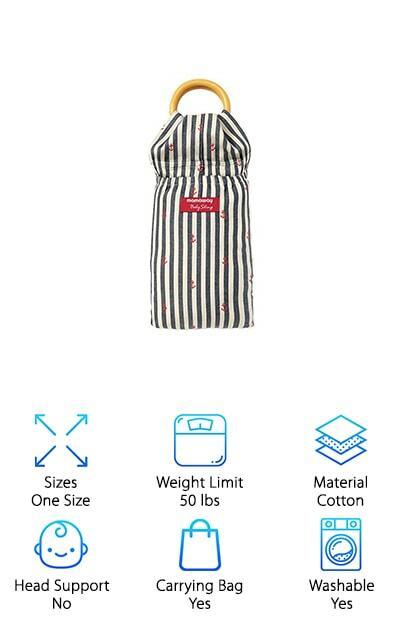 We love that it’s made of 100% breathable cotton so you can be sure your baby won’t get too hot on warm summer days. The ring closure means business. The manufacturer tested it to hold 100 pounds for 24 hours. This is one secure sling. The Hip Baby Ring Sling Baby Carrier is our choice for best baby ring sling on a budget. It’s really easy to adjust and can be used from infancy to toddlerhood. 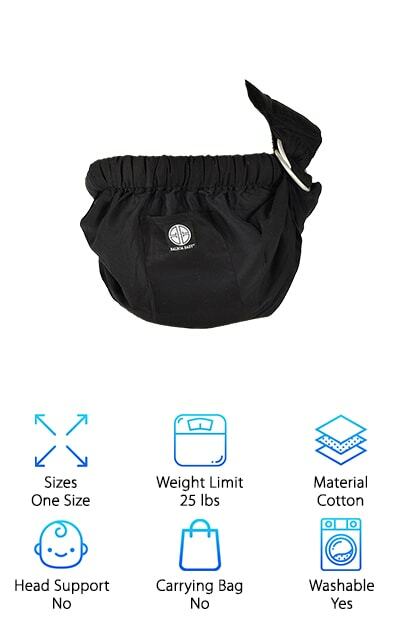 It holds up to 35 pounds and lets you use a front or hip carry. It’s made of 100% breathable hand-loomed cotton while the ring is made of strong, lightweight aluminum. 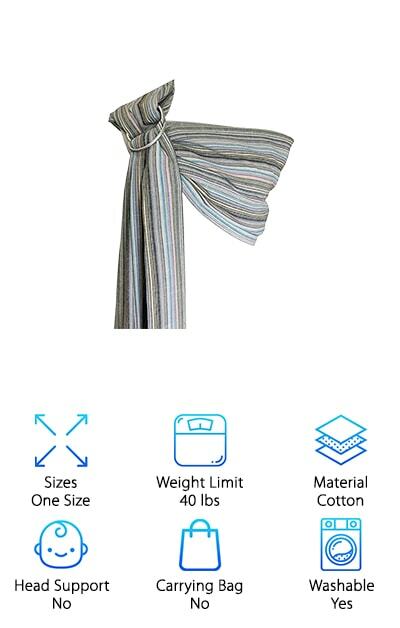 These slings are eco-friendly and individually made in India using fair trade materials and non-toxic dyes. They’re as beautiful as they are functional. And here’s the best part. We know this doesn’t really have much to do with how great this carrier is, but it’s available in 26 different colors/patterns. We just love that it lets you and your baby express your individual style. Next on our list for best baby sling carrier is the Vlokup Baby Ring Sling. This one’s available in an impressive 24 different patterns and colors which makes carrying your baby all that more fun. These are made of 100% cotton. They’re soft and breathable which makes them ideal for summer but they can still keep the winter chill away. The ring is made of high-strength, lightweight aluminum. This one is safe for newborns, babies, and toddlers up to 40 pounds so you’ll likely be using it for years to come. One of the cool things about this carrier is that once you have the sling in place, there’s a long drape of fabric that hangs down. This is in the perfect spot to use as a breastfeeding cover if you want more privacy. This baby sling carrier from Maya Wrap is extra comfortable. Why do we say that? Well, for starters, it’s made of breathable hand-woven cotton. But something that sets this one apart from what we’ve seen so far is that it has a lightly padded shoulder. This makes it even more comfortable. It’s not too bulky and doesn’t affect any adjustments you’ll have to make to get a perfect fit. The rings are made of strong, lightweight aluminum and are made to handle up to 35 pounds. 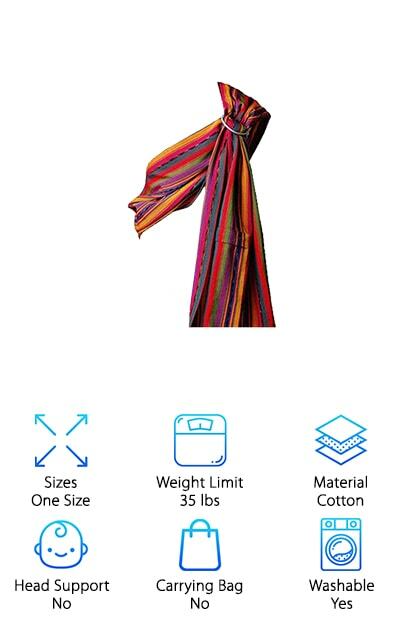 Don’t worry, there’s more than enough fabric to fit both you and your baby as he grows. And get this, it also has a convenient zippered pocket where you can stash small valuables while you’re out on the go with your little one. Another choice for an excellent ring sling baby carrier comes from Beco Baby. It’s made for babies and toddlers who weigh between 7 and 35 pounds. It’s made of thick 100% cotton that’s durable and sturdy but still breathable. This isn’t the same lightweight material that a lot of other slings are made of. It’s a little stiffer so if you’re looking for a baby carrier sling that’s got a little more to it, this one might be a winner. The sling is held in place with only 2 sturdy metal rings, no buckles, no tying required. There are a lot of ways to use this sling and Beco gives you plenty of access to instructional materials. And one more thing. This ring sling is machine washable. Plus, you can even throw it right in the dryer. Dr. Sears is famous in the infant world so it’s no surprise that the next newborn baby sling on our list comes with his seal of approval. 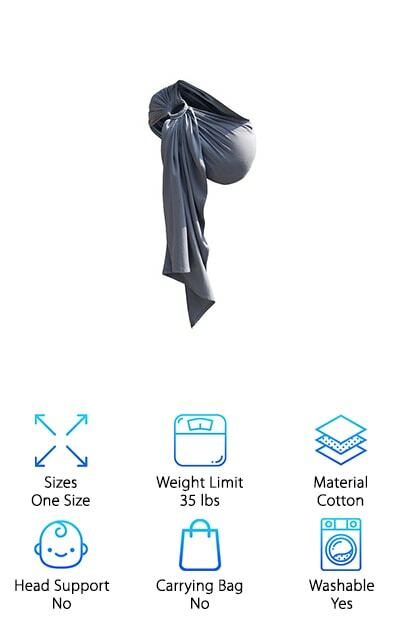 This one-size-fits-all design can hold your baby in 5 different positions and is appropriate for use when your baby reaches 8 pounds up until she’s a 25 pound toddler. We actually think this is the best ring sling for older babies. It has a deep pocket with elastic across the top that will keep your little one safe and nestled in. This sling can be easily folded up and placed in a diaper bag or tucked into the basket on a stroller. One more thing: this one has a padded shoulder that makes it extra comfortable for you while you’re carrying your little one. The Karma Baby Slings Organic Sling is an organic baby sling that’s super easy to use. There aren’t any rings or fasteners yet it sits on your body just like a standard ring carrier. It’s a great choice for newborns but it can hold toddlers, too, up to 35 pounds. Something that we really love about this sling is that it has a pocket and a toy ring. The pocket is great because it gives you a place to tuck away any extra supplies you’ll need. And trust as, as your baby gets older, she’ll come to love the toy ring. Just attach her favorite toy and she’ll be a happy camper. Plus, it’s easy to use, you just slip it over your shoulder, slip your little one in, and adjust as needed. Vrbabies ComfortFit sling is the best baby sling made specifically for infants. It holds up to 20 pounds so it can handle some small toddlers but that’s not what it was designed for. So, if you’re not concerned with toddlerhood yet and want something made for your little one, here you go! It’s made of 100% cotton and great for everyday use. It’s lightweight and breathable so no need to worry about hot summer days. 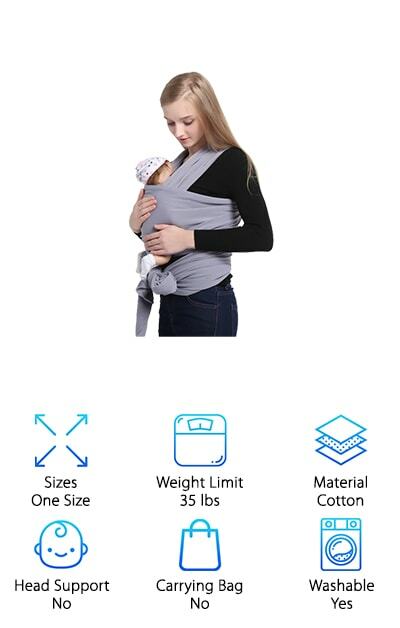 One of the reasons this is such a good sling for little ones is that it was designed to hold them in the same position that they were in the womb. This makes it easier for them to make eye contact with you and puts your mind at ease because you can always look down and see their face. Are you looking for a carrier that also gives back? One of the things we loved about the Rockin’ Baby Ring Sling is that they make every effort to do some good in the world. For every sling they sell, they donate another to a mother in Haiti. It’s mothers helping mothers! What you (and the Haitian mother) get is this 100% cotton, bright orange sling. The rings that are included are red so it’s safe to say that this is a baby carrier that makes a bold statement. You can use this with toddlers, too, it’s good for little ones up to 40 pounds. And that’s not all. There’s even a small zippered pocket where you can stash a few extra diapers or any other small things you need on hand. The next baby pouch sling on our list is the Vicsou Baby Ring Sling. The thing that we like the most about this one is that it actually gives you a choice how you want to use it. If you can’t make up your mind about whether you want a ring sling or baby carrier wrap, don’t worry. You don’t have to! This sling comes with a set of rings so you can use it as a proper ring baby carrier if you want to. If you’d rather use it as a wrap carrier, it’s definitely long enough to do so. It’s really nice to have to option to go back and forth, especially as your baby grows because you never know how he or she is going to be most comfortable.